Aaron “Doug” Strickling, 61, of Gardner, passed away August 20, 2016 at Olathe Hospice House. Inurnment with Military Honors will be 2:30 pm Friday, September 2, 2016 at Leavenworth National Cemetery, Leavenworth, KS. Memorial contributions may be made to Bruce Funeral Home to help with expenses. Arrangements by: Bruce Funeral Home, Gardner 913-856-7111. Doug was born December 13, 1954 in Joplin, MO to Aaron G. and Joyce (Brasher) Strickling. He graduated high school in Joplin. Doug served for the United States Army and was part of the Military Police. Later he was a Police Officer for the City of Gardner and then Garden City where he retired from in 1984. Doug was a member of the Church of Latter Day Saints in Wellsville, KS. 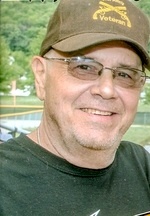 He loved the Kansas City Royals and was passionate about riding his Harley Davidson. He will be missed by family and friends. Doug was preceded in death by his parents. He is survived by his children: Timothy Strickling of Spring Hill, KS, Michael Strickling of Holden, MO, April Sprague of Baldwin City, KS, Spencer Strickling of Gardner, KS and Cheyenne Schuster of Salina, KS; siblings: Debbie and Fred Hatt of Gardner, KS, Teresa and Terry Hargiss of Olathe, KS, Randy and Connie Strickling of Olathe, KS and Sharon and Marie Young of Ottawa, KS and eight grandchildren.